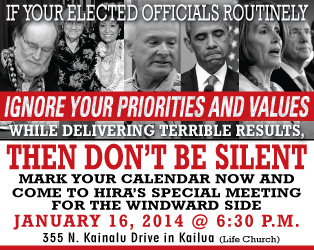 Please make plans to join us at our HIRA Road Show one week from today in Kailua. This is a 'must attend' event to kick off Election Year 2014. A LOT of information will be presented for the benefit of voters, taxpayers, candidates and activists alike. HIRA's Road Show is FREE and open to the public. HIRA officers will be laying out the problems created and exacerbated by Hawaii's political establishment, followed by a clear explanation of why decades of poor leadership by Democrats has not been met with strong opposition. After that, the HIRA team will discuss the various paths to political victory. There will be a special guest appearance by none other than Ewa Beach's Republican state representative Bob McDermott, who has just done battle at the State Capitol during the infamous 'special session' and is now preparing to return to the lion's den during the state legislature's regular session later this month. Bob will provide us with valuable insights from the past as we prepare for 2014 and beyond. Please click HERE for a map to the event location (Life Church in Kailua) . . .
. . . and click HERE for the official flyer for Kailua's HIRA Road Show, one week from today. We really hope you can join us next Thursday for this important (and free) event. Let's come together to understand the extent of the challenge before us. Then let's unite in purpose and action to make Hawaii better for ourselves and future generations.